I was never sure whether to talk about Celer in the ambient appreesh thread or the drone thread, so here's a thread of their very own. Because they are worth it. I feel indebted to shorty for introducing me to this group. Perhaps I would have eventually found out about them some other way, but regardless, they are my favorite ambient music discovery, and one of my favorite discoveries period, of the past year. Celer is dead. Celer LIVES! Celer was the artistic partnership of Dani Baquet-Long and Will Long, which yielded somewhere around 50 full length albums in the minimalist/drone/ambient genres, about half of which have not been released yet, and all of which (that I've heard) are exquisitely crafted and deeply emotionally resonating. Tragically last July saw the inexplicable passing away of Dani from heart failure at the age of 26, a couple weeks or months after shorty began talking about them here. No new Celer albums have been made since, or will be made. The more albums I listen to by Celer the more I find that it's absolutely impossible to summarize what they had to say with only one of them. Anybody that has heard and enjoyed a single Celer album should make it a top priority to hear more, because they're very diverse while being incredibly consistent in quality. oh yeah there's lots of Celer to download on shorty's blog. i hate it when artists have so many releases like this. because i never re-listen to any of their stuff, i just download more. I love it because as long as you pace yourself properly, it's like having a nearly endless stream of new material to enjoy. It's tempting to go out and grab as many albums as you can find, if you like their general aesthetic, and I've been doing this to some extent lately; but I'm also wary that listening to a Celer album for the first time should be as special as listening to, for example, a new Flying Lotus album (insert you favorite band here) for the first time - the comparison only used to show how special the experience could potentially be, not to suggest any similarity in their music. Of course, this will only be true if you really love Celer, like me. But so I've been trying to slow down a bit and really drink in the albums I've collected so far, and make occasions out of trying out new ones, not spoiling them by being too casual. can you suggest a good first album to delve into? 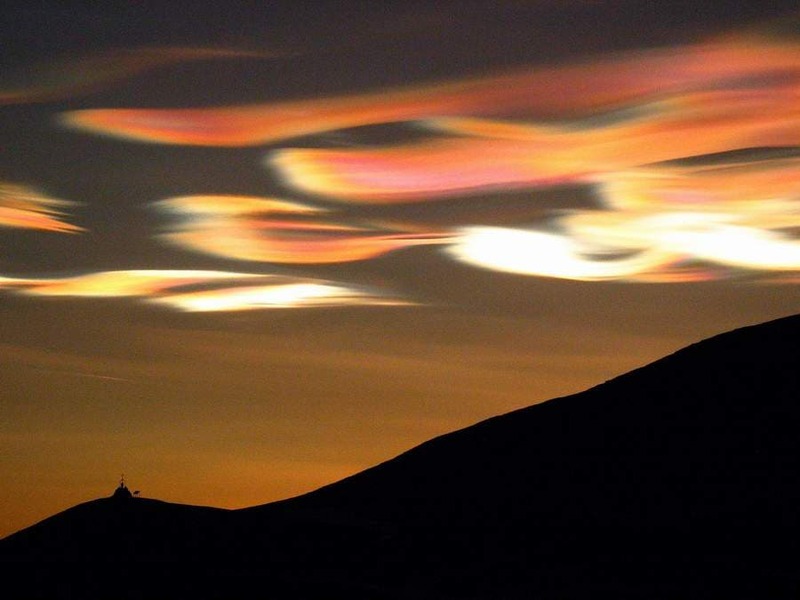 The concept of the album was to musically capture nacreous clouds, which are rare, short-lived clouds that form in the uppermost reaches of the atmosphere (60,000 to 80,000 ft). Because they form so high up, light reflecting off the earth illuminates them from beneath, and they often display brilliant colors. In accordance with this, the album was made from 37 brief tracks that float by in gentle, colorful wisps. They executed the concept pretty much perfectly; there are many different textures, shapes and colors throughout the album, just like there are an amazing variety of nacreous clouds, but all of them feel consistently soft and cloudy. Having the many different tracks makes the album easier to swallow than their albums made from only a few tracks or 1 track, which are most of their albums. Another one with lots of tracks is Capri, but I think Nacreous Clouds flows better and feels much more cohesive. Shuffle is highly encouraged for this one. For some time now I've thought about how to create an album that would sound perfect played in an arbitrary order, but I think I've been beat to it with Nacreous Clouds. Still, there's the even greater challenge of making a seamless, gapless album that sounds perfect in any order. Now that would be amazing to hear. my favorite album is Continents. i usually put it on before bed and always stay up to listen to it all. I've only given Continents one listen; saving it for some time later while I explore other albums more fully. I remember it being deep and dark. also this Thread's first post is what mumblings should be about. cursory asperses was really nice. gonna check out some more. do you happen to have link for Mane Blooms? Grabbing Sunlir/Scols and Diluted. I'm trying to find parts One and Four from Four Parts...the other two are impeccable. What's this file type Sunlir/Scols is in? Hmm, on Megaupload it calls it an "application/octet-stream"; I tried downloading it and got an unknown file type.